As some of you may know Yesterday was the 10th anniversary of the release of one of the most recognized Key's Visual Novels, I'm talking about CLANNAD (Of course the Anime adaptation by Kyoto Animation is one of the most popular and critically acclaimed Anime of all times). To commemorate not only Key released an Artbook (well that was last year) and has announced a PSVita port, but now Kai, the writer in charge of the Kyou route, has made some very interesting declarations. In his twitter he wrote that now that 10 years have passed it was time to "revealing a truth". Kai confesses that he had plans to produce a Kyou ~After Story~ (A spin off centered around Kyou in the same nature as with Tomoyo in Tomoyo After ~It's a Wonderful Life~), but that after CLANNAD was released for sale, he himself decided to shun the project. He doesn't give more details as for the reasons that lead to this decision, but he adds that it was a very difficult and painful decision for him. 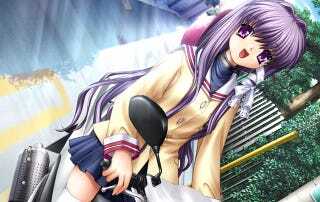 How about that, I for one know that I would have liked an extra route for Kyou.